ORLANDO, Fla. — The Orlando Magic showed no mercy on an undermanned New Orleans team, routing the punchless Pelicans. 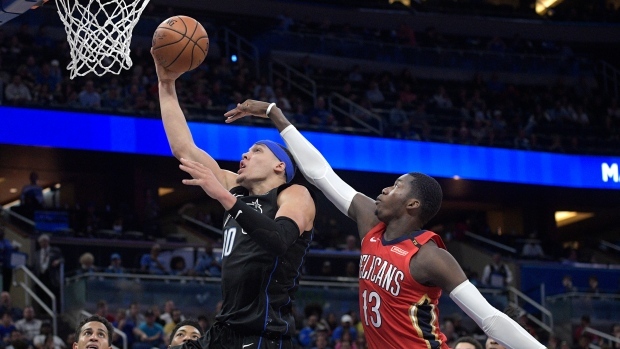 Terrence Ross had 19 points and Nikola Vucevic added 15 points and 17 rebounds for the Magic, who had little trouble finding shots inside or outside against the defenceless Pelicans. Orlando is chasing Miami for the final spot in the Eastern Conference playoffs. Defence was all the Magic players wanted to talk about. They limited New Orleans to 37.3 per cent shooting and completely eliminated Pelican point guard Elfrid Payton, who was on a roll coming into the game. "It wasn't anything I said (during the timeout), we just played a lot better defensively," Magic coach Steve Clifford said. "I think our defence is more consistent every night." Vucevic had almost as many rebounds (14) as the Pelicans (18) in the first half when New Orleans shooting provided plenty of opportunities. The Pelicans started the game 1 for 14 from the field and didn't get much better after that, finishing the half 18 of 52 (34.6 per cent).